Whether painting for his reader a train's boxcar or a rare butterfly, Vladimir Nabokov handles the description with precision. He wields his weighty vocabulary like the sharpest of pencils and sketches every detail of the object in question. I could see the segmented panes of glass in the doors on his trains. I could conjure the dainty butterfly's wings, the artful eye markings on each side. My journey through his memoir Speak, Memory felt much like a walk through a gallery full of line drawings, the most detailed, and perfect black and white line drawings imaginable. He inspired me in so many ways. I could have opted to write about his use of time juxtaposition, propping up the past in relation to the present for the sake of explanation, or about his careful use of specific objects, a tablecloth or a pair of spats, in any sequence to symbolize the greater significance of that particular time. But what I've decided to touch on instead is Nabokov's use of color, simple color, ordinary color, to enhance his line drawings and draw the reader's eye and mind exactly where he wants it to be without complicating the original goal of the moment and memory. I first noticed his deft use of color early in the book when he describes watching from the dining table through the second story window as his father is tossed in the air by a group of grateful peasants, presenting his family with "a marvelous case of levitation." The memory is a unique one and Nabokov positions his reader by his side at the table in order to view it. We know the layout of the room, his father's political position in relation to the peasants, even what comprises the meal served on the table before them. Those are the graphite lines on the white paper. But the point of the memory has to do with the specific impressions of the young boy at the table who sees "through one of the west windows... the figure of [his] father in his wind-rippled white summer suit... gloriously sprawling in midair... [then] on his last and loftiest flight, reclining, as if for good, against the cobalt blue of the summer noon" (Nabokov, 31). The reader has her bearings, but really comes away with the memory of a flash of sprawling white against blue. It's the color that makes it memorable. This technique is fitting for a man who began associating deeply with color at a very young age. He imparts, for example, that he once experienced a "fine case of colored hearing" (Nabokov, 34). This is how he describes associating the separate letters of the alphabet with individual and highly specific colors, "In the green group, there are the alder-leaf f, the unripe apple of p, and pistachio t" (Nabokov, 35). Slightly later in life, he remembers a box of colored pencils the way someone else might remember their pets. "The green one, by a mere whirl of the wrist, could be made to produce a ruffled tree, or the eddy left by a submerged crocodile" (Nabokov, 101). These colors snagged in his brain and remained there until he brought them forth to share with his readers. 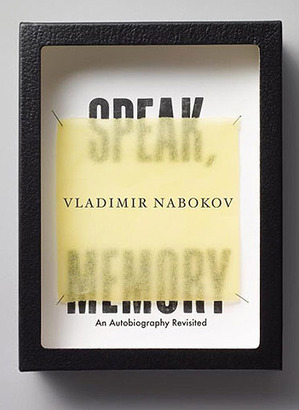 What I most want to take away from this reading of Speak, Memory is the way Nabokov keeps the color descriptions simple, minimal when compared with his description of anything else. When he describes his home, for example, and the preparations for evening, he mentions that a valet would walk down the corridor and "drop the blue voluminous blinds" (Nabokov, 88). Voluminous is used precisely here, and it gives the reader and understanding of size and shape, but it is the blue which sticks in the reader's memory. This is also the case when Nabokov later describes his obsessions with clothing and meticulously catalogs his own outfits along with the outfits of his family and friends. Certainly the period clothing, ruffled blouses, bloomers, suspenders, and spats are memorable, but the dashes of color help us to see them. The "bright-yellow" jumper and the "gray" spats, for example. He never goes overboard when touching on color. The colors appear to the writer in flashes, the same way they would appear if we were walking down the street and seeing passersby, or through a field and seeing a butterfly, instead of reading about them. It allows the experience to transcend reading (or perhaps it allows the reader to transcend time). I love descriptions, the reading of them and the writing of them. It comes easily to me, recording what I've seen and heard, smelled and touched, on the page. However, with this lesson from Nabokov I feel I can purposefully move through the exercise of a description and dollop the colors in the appropriate places without distracting from the story. I attempted this in the latter part of my piece on loneliness, something very much a work in progress, when I noted the color of the sky at twilight as dark blue and our car as burgundy. Before choosing my craft topic, I probably would have complicated those descriptions with grander metaphors or else skipped the color altogether. Color is best when used sparingly, to catch the reader's eye and to hold in the reader's memory. Nabokov's ability to associate one sensation with another has also triggered a new idea for me. When he described being at the beach in Spain as a child, he spends some very worthwhile time describing the man who trucks around the treats for sale. Nabokov lists the delicacies, "sugared violets, pistachio ice cream of a heavenly green, cachou pellets, and huge convex pieces of dry, gritty, waferlike stuff that came from a red barrel" (Nabokov, 147). Three colors stick out to me in this description: violet, pistachio green, and red. There are also shapes, textures, and flavors provided, but the colors are splashy. Better than that, violet doubles as a color and a shape, and the heavenly green of the pistachio ice cream comes off as both color and flavor. This is a familiar concept to most readers; we are used to not being able to separate the color orange from the fruit orange from the flavor orange. Nabokov taps into multiple senses at once, and it triggers a visceral reaction from his reader. This is something I would like to try. Reading Speak, Memory was a pleasure. One of my favorite parts of reading autobiography/memoir is the opportunity to admire both the writing and the life story. I will remember more details from Nabokov's life than many others I've ready primarily based on the way he used color to bait me, startle me, seduce me, and stain me.